The world did not end. Switching on the world's largest and most powerful particle accelerator near Geneva, Switzerland, did not trigger the creation of a microscopic black hole. And that black hole did not start rapidly sucking in surrounding matter faster and faster until it devoured the Earth, as sensationalist news reports had suggested it might. Of course, because you're alive and reading this article today, you already knew that. 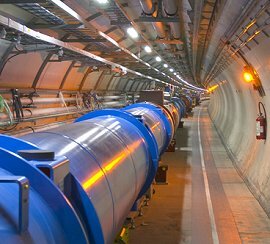 Currently the accelerator, an underground ring 5 miles across called the Large Hadron Collider (LHC), has been shut down for repairs. But once the immensely powerful machine starts back up, is there a chance that the doomsday scenario could still occur? Relax. As Mark Twain might have said, reports of Earth's death have been greatly exaggerated. "There never really was a danger from the accelerator, but that sure didn't stop people from speculating that there might be!" says Robert Johnson, a physicist at the Santa Cruz Institute for Particle Physics and a member of the science team for NASA's Fermi Gamma-ray Space Telescope, which launched in June to study gamma rays from many phenomena, including possible evaporating black holes. There are several reasons why the world did not come to an end on Sept. 10th, and why the Large Hadron Collider isn't capable of triggering such a calamity. First of all, yes, it is true that the LHC might create microscopic black holes. But, for the record, it could not have created one on its first day. That's because the physicists at CERN didn't steer beams of protons into each other to create high-energy collisions. Sept. 10th was just a warmup run. 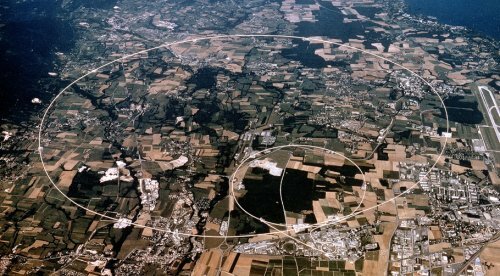 To date, the collider still has not produced any collisions, and it is the extreme energy of those collisions — up to 14 tera-electron volts — that could potentially create a microscopic black hole. Actually, once the LHC is running again and begins producing collisions, physicists will be ecstatic if it creates a tiny black hole. It would be the first experimental evidence to support an elegant but unproven and controversial "theory of everything" called string theory. In string theory, electrons, photons, quarks, and all the other fundamental particles are different vibrations of infinitesimal strings in 10 dimensions: 9 space dimensions and one time dimension. (The other 6 space dimensions are hidden by one explanation or another, for example by being "curled up" on an extremely small scale.) Some physicists tout string theory's mathematical elegance and its ability to integrate gravity with the other forces of nature. The widely accepted Standard Model of particle physics does not include gravity, which is one reason why it does not predict that the LHC would create a gravitationally collapsed point — a black hole — while string theory does. Many physicists have started to doubt whether string theory is true. But assuming for a moment that it is, what would happen when a black hole is born inside the LHC? The surprising answer is "not much." Even if the black hole survives for more than a fraction of a second (which it probably wouldn't), most likely it would be flung out into space. "It would only have the mass of a hundred or so protons, and it would be moving at near the speed of light, so it would easily have escape velocity," Johnson explains. Because the tiny black hole would be less than a thousandth the size of a proton and would have an exceedingly weak gravitational pull, it could easily zip through solid rock without ever touching — or sucking in — any matter. From the perspective of something this tiny, the atoms that make up "solid" rock appear to be almost entirely empty space: the vast space between the atoms' nuclei and their orbiting electrons. So a micro black hole could shoot down through the center of the Earth and out the other side without causing any damage just as easily as it could shoot up through 300 feet of the Swiss countryside. Either way, it would end up out in the near-vacuum of space, where the odds of it touching and sucking in any matter so that it could grow into a menace would be smaller still. So the first thing a micro-black hole would do is leave the planet safely behind. But there are other, even stronger reasons why scientists believe the LHC poses no threat to Earth. For one, a black hole created in the LHC would almost certainly evaporate before it got very far, most scientists believe. Stephen Hawking, the physicist who wrote A Brief History of Time, predicted that black holes radiate energy, a phenomenon known as Hawking radiation. 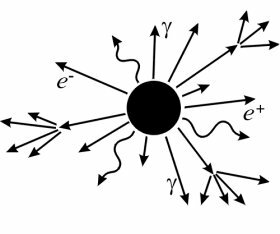 Because of this steady loss of energy, black holes eventually evaporate. The smaller the black hole, the more intense the Hawking radiation, and the quicker the black hole will vanish. So a black hole a thousand times smaller than a proton should disappear almost instantly in a quick burst of radiation. "Hawking's prediction is not based on speculative string theory but rather on well understood principles of quantum mechanics and particle physics," Johnson notes. Despite its strong theoretical foundations, Hawking radiation has never been observed directly. Still, scientists are confident that any black hole created by the LHC would pose no threat. How can they be so sure? Because of cosmic rays. Thousands of times per day, high-energy cosmic rays strike the Earth's atmosphere, colliding with molecules in the air with at least 20 times more energy than the most powerful collisions that the LHC can produce. So if this new accelerator could make Earth-devouring black holes, cosmic rays would have already done so billions of times during Earth's long history. And yet, here we are. Let the collisions begin!